Yes, the clock tower is here to stay,.... at least for now. According to Sabah Town and Country Planning Department Director, Mr. Mursidi Hj. Sapie, the Central Board has rejected the proposed multi-storey mixed-commercial project near Atkinson Clock Tower. Read about Life around Atkinson Clock Tower. 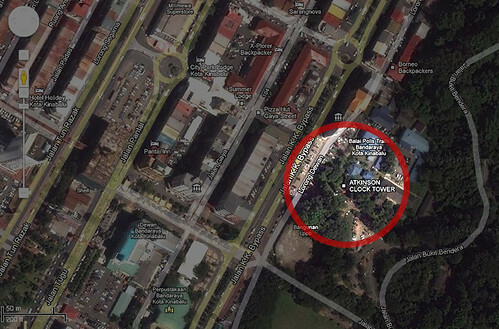 Former LPPB HQ building is right on the perimeter of the red circle. This should be a good news to the many who opposed strongly to the proposed project. Their joy may still be short lived as the developers can appeal upon fulfilling the requirements of the environment impact assessment (EIA) report as well as museum and tourism authorities' conditions. The project was approved by the former local authority and the old Sabah Housing and Town Development Authority (LPPB) headquarters building had already been demolished. That is the extent of determination by some quarters to bulldoze their plan for a multi-million ringgit worth of commercial project. If it was not for the determination of several NGOs, activists, as well as environmentalists in opposing to the LPPB plan, the clock tower would just be a history today. Of course the developers would want to recover their cost for doing preliminary works, so they will not just sit and do nothing about this decision to reject the project. In the end it is the tax payers and the people as a whole are the ones on the losing end. And this is because of lack of good planning by those responsible for laying out plan for our city (then town, that is how LPPB got its tag, 'town planning'). 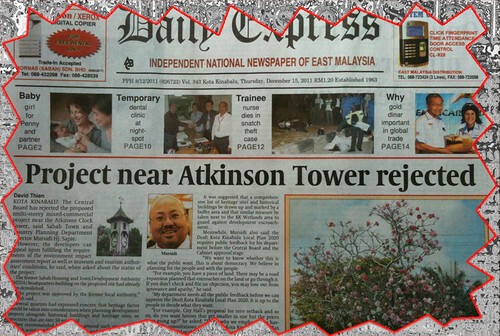 So, Atkinson tower is here to stay! If they decide to build the commercial centre later, the promised buffer zones around the site must be respected and not turned into ugly back alley suitable only for rubbish dumping. If a Coal Power Plant can be rejected ,what's this shopping complex compared the significance of the historical clock tower. I agree with Dora... this is really good news!... at least for now la kan. Manatau lain kali ada ni mo kacau balik. As pointed out by one of the commenters (Anonymous), the project may still go ahead if the the developers can fulfill the requirements of the relevant authorities. On the front page of the next issue of the same newspaper, the concerned department director was saying otherwise.